This house is cursed and it has been a haven of evil spirits for as long as anyone can remember. Who dares to banish them? Charge the ancient amulet and cleanse the house from the evil using your Match 3 skills! 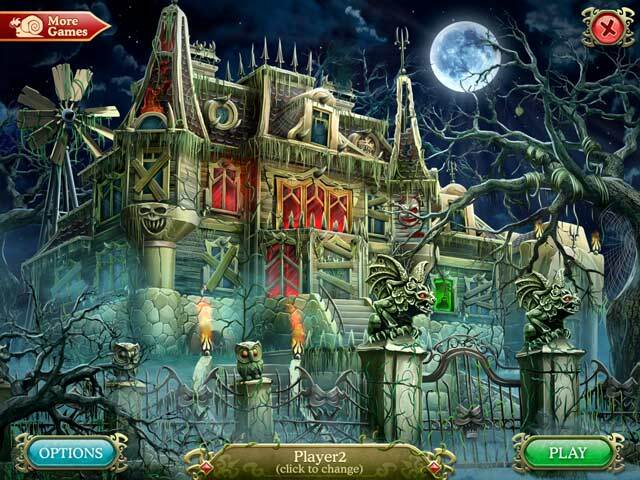 Enjoy mini games including solitaire, hidden object and spot the difference scenes. Do you have what it takes to lift the curse and restore the home to its former beauty? Cursed House 3 is rated 4.3 out of 5 by 30. Rated 5 out of 5 by judy2g from Hard to quit playing This is a really habit-forming match three game and it has some really cool different challenges, Enjoy playing it. Rated 5 out of 5 by goldenpixie1 from Thoroughly Enjoyable I'm at level 59 and I've been enjoying every minute of this game. Challenging enough to keep me interested, yet not so challenging that I give up and never play again. Will have to play Cursed House 2 and 1 after this one! Rated 5 out of 5 by n7sg from Addictive game A very addictive game. Just one more level.....Lots of fun with explosions and colorful items. The additional find-the-difference screens are challenging. The drawings are sharp and clear. I really like this game. Rated 5 out of 5 by rheashard2 from fun match 3 This is a fun match 3 with excellent graphics and sound effects. I loved how each level had progressively harder objectives to complete. Some objectives are a combination of firing cannons, opening trunks, chasing lady bugs or matching tiles after setting them on fire and lead the tiles to iced coins for defrosting. I definitely enjoyed the difficulty option; Casual with unlimited moves and time or limited time or limited moves. This makes this game good for different levels of match 3 players. This game also has a couple of mini games spaced thru it. The spot the differences is on the hard side. The differences are often so slight that they can be easily overlooked. I used the hint button a lot. 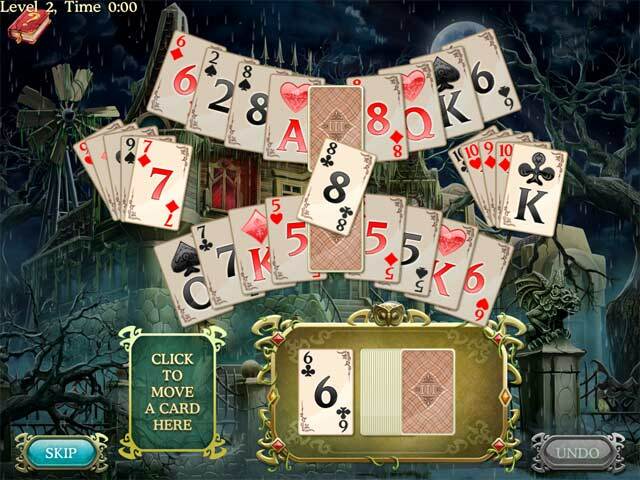 The second is a card solitaire game. It has a skip button for those not interested. My only complaint is that there isn't a way to replay levels once you move on to next level. Rated 5 out of 5 by denniann2 from really loved this game!!!!! a great M3 game. it has mini games of spot the differences they can be hard. also solitaire games as a mini games. completed a good many of them. they were high-low games. you restore a "cursed house" to it's original glory throughout the game. easy for kids as well. Rated 5 out of 5 by Mamakin2 from LOVE LOVE LOVE even better than Cradle of Rome This game is just too much fun! Action Action Action, all the time! Bombs, explosions, fire, liquid drops, blasting bugs, and tiles are always crashing and falling. LOVE!! If you're like me it's all about the sounds and this game has the BEST of them - crashing, clinking, breaking, ba-booms. And then they throw in quick fun mini card games to calm down your mind :) Then right back to all the fun. Challenging but not frustrating. You don't get bogged down, bored, or stuck on one level. You don't have to go back to the top of the board and match tiles all downward over and over in order to work a way to break that stubborn one at the bottom. Background music is perfect, visuals are bright, big, with clarity, EASY to see! I like this better than the Cradle games and I LOVE the Cradle games! Rated 5 out of 5 by maggie130 from Best Cursed House I have all 3 Cursed House Games, and although I really liked 1 and 2, this was the most fun. Looking forward to 4 if they do as good as 3. Rated 5 out of 5 by persephone329 from Don't Miss This One! Having played all three of the games in this series, I'm excited to say this one does NOT disappoint. I find the problem with most match 3 games is that they become very tedious really quick. 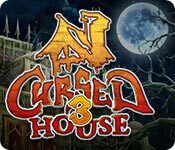 Cursed House 3 is delightfully original in the challenges it presents. 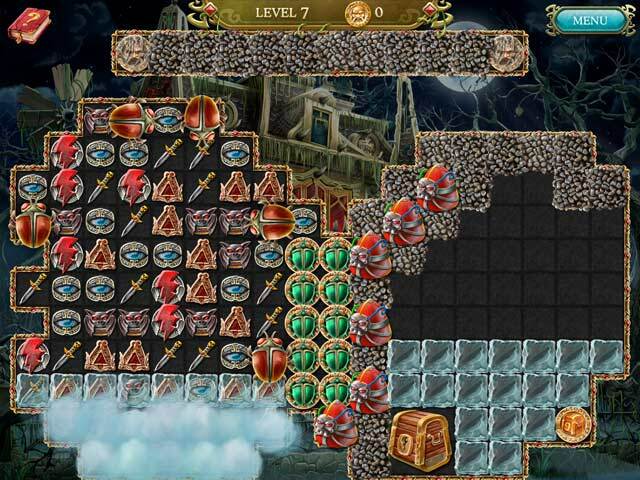 Even the toughest boards have several objectives that keep you interested as you fight to obtain all the board's coins. It's definitely the best match 3 game I've played! Rated 5 out of 5 by sheepqueen from Loved #3 Great game! My favorite of the 3.